In January 1978, at the age of five, my world was changed forever by an inaugural encounter with the cinematic realm. The film in question was Star Wars and, like fellow members of Generation X, I've followed the series in its multitude of media incarnations from books to toys. However, video games remain the fondest forum since the early Atari coin-ops. Jedi Academy is the second sequel to Jedi Knight and rapidly follows in the wake of Jedi Knight II: Jedi Outcast. And, as such, is the third instalment. The speed of the game’s port, to the Macintosh platform, is indicative of the timely talent of Aspyr Studio and the insatiable appetite of Mac gamers for original and licensed product. The most pertinent question on many gamers’ minds is: will it suffer from trilogy exhaustion? The graphics are augmented by Raven Software’s code enhancements. The sumptuous visuals belie the Quake III game engine’s four-year age! 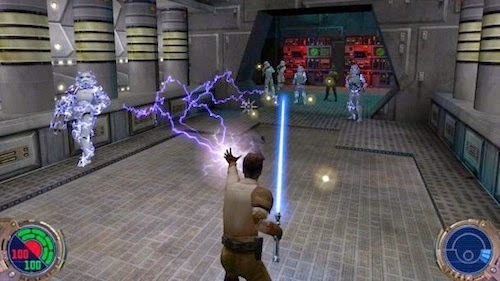 Rain super heats as it falls onto a striking lightsaber and the character animation is suitably smooth and fluid even on modest hardware (this review was conducted on an 800MHz iMac G4 with 512MB RAM). Close combat has not witnessed such balletic battles since Darth Maul cartwheeled onto celluloid in The Phantom Menace. The sound design is unquestionably of a pedigree deserving of the title’s roots. My review sessions were monitored using JBL Creature speakers, which rendered an involving and detailed three-dimensional sound stage replete with the familiar sounds of a galaxy far, far away. I lamented being unable to savour the delights of a 5.1 mix, however. Where would a Star Wars adventure be without the familiar underscores of John Williams’ familiar (if overused) leitmotifs? No longer used in their original cinematic context, here his orchestrations inform your journey to become a Jedi. In this outing Kyle Katarn (who made his first appearance in the legendary Dark Forces) is no longer the principal protagonist and acts as mentor alongside Luke Skywalker. Instead the game designers adroitly avoid any tenuous contrivances and invite you to create a new character from scratch albeit one who goes by the fixed name of Jaden Korr. The inevitable Sims (no it’s not Skywalker Family Ties) comparison cannot be ignored, but doesn't detract from the short-lived novelty of deciding gender, species and lightsaber type (later stages allow for the wielding of two lightsabers and Darth Maul’s infamous double-bladed lightsaber). During the early stages of Jedi Academy, as you investigate the whereabouts of Luke's missing journal, the missions allow you to hone and enhance your Jedi powers before the saga starts gaining momentum. In between levels you get to choose between Light and/or Dark Force powers and either Choke or confuse your opponents with Mind Trick. The decisions you make delineate character, which is a neat twist and one that leads to a choice culminating in two possible endings. The decision to provide the lightsaber from the outset was an inspired one – you now get what’s on the box – instant gratification. The galaxy-spanning missions take in the sights and sounds of Yavin 4, Tatooine and the derelict Rebel Base on Hoth. Friends and old enemies return to assist or impede your path. Incidentally, I took great delight in confronting Bucket Head (fans will know who I am referring to)! And utilising mounts i.e. Tauntauns adds an arcade aspect to the title. The multiplayer section is undoubtedly the most compelling facet of Jedi Academy. Alongside the obligatory Capture the Flag and Free For All is Siege. The brand new Siege mode takes it cue from Wolfenstein's class-based objective mode and involves co-operative play. This allows for tremendous strategic scope and success will be determined by the abilities of the team. From Duel and Power Duel to the Siege mode – even the most jaded multiplayer veteran should find something to satiate their needs. Jedi Academy lacks a compelling narrative; dramatic pace is thwarted by a non-linear mission interface. And the title gravitates more towards Beverly Hills 90210 or Dawson's Creek sans angst - will the kids ever graduate? Although one can make an ideological choice between the Light and Dark side of the Force, the consequences are bereft of any deep emotional resonance. This is no Greek tragedy. On an entirely subjective note, the temptations of the Dark side can be overwhelming and brandishing a red double-bladed lightsaber is supremely seductive! The play experience lost some of the anticipated lustre due to stuttering frame rates in the first patch (1.0.1a) for the single-player edition. Programmer Brad Oliver rapidly addressed this issue and it is strongly recommended that you apply the most recent patch (1.0.1b). This should solve matters for Mac OS X 10.3.x Panther users. However, I didn't have a copy of Mac OS X 10.2.x Jaguar to perform a comparison test. The Jedi Academy bonus multiplayer maps extend the game’s life cycle. The addition of a level from Ord Mantell (referenced in The Empire Strikes Back and further explored in the comic strip serial by Archie Goodwin and Al Williamson) should bring a smile to the face of any fan – it’s where Han Solo encounters one of Jabba The Hutt’s notorious bounty hunters. Whilst this is the perfect primer while we wait for the Macintosh port of Star Wars: Knights Of The Old Republic, it remains to be seen whether or not there is any life left in the Jedi series. However, for sheer kinetic fun adorned in the furnishings of the Star Wars franchise, you'd be hard-pressed to ignore the emotive thrill of brandishing two lightsabers at once and the ensuing Stormtrooper decapitations!